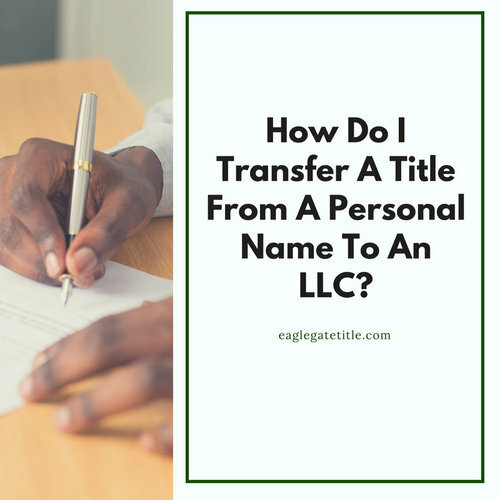 You are here: Home / Our Blog / Helpful Resources / How Do I Transfer Title From A Personal Name To An LLC? Forming a limited liability company, or LLC, and then having a property title transferred to it from the owner is a common course of action taken by real estate investors and rental owners. This is because if a lawsuit is filed against the person who owns the property (if someone is injured on the property, for example), that person’s liability is limited as a result of the St George title transfer. Furthermore, it is a good idea to establish a series of LLCs if you are someone who owns numerous rental properties in Washington County or beyond. This allows each one to be insulated from liability claims that may have to do with other properties. Here’s what happen in order to complete a St George title transfer. This can be done in person or online. Correspond with whatever agency in your state handles business filings to create an LLC. This is a relatively simple task to complete and is a lot less involved than you might think if you have never formed an LLC before. Go to the IRS’s official website and fill out the appropriate form to get a Tax ID Number. You may need a EIN (Employer Identification Number), also called a Federal Tax ID Number if your LLC has employees or multiple owners. This number will allow you to open a bank account using the name of your LLC. You need to do this because the finances associated with your LLC need to be separate from your personal finances for obvious reasons but also because it is necessary to avoid losing your LLC’s liability protection. Depending on the state, deed requirements can vary but in most cases you will go to the recorder’s office of your county to get a deed form. Your warranty deed will be necessary in order to complete the St George title transfer. If for some reason you are having issues acquiring this form, let us know at Eagle Gate Title and we’ll help you. In some states, you are required to go to the county offices to obtain the warranty deed. However, when dealing with a St George title transfer at Eagle Gate Title, we can do this for you. We’ll make sure it gets signed and recorded properly so you don’t have to add that to the list of things you need to do. Remember that when reviewing the warranty deed on your own, the LLC is the grantee and you are the grantor. To complete a St George title transfer, all leases need to show that the LLC is now the tenant’s landlord. Rent payments need to go into the LLC bank account that you created. Fundamentally, the main reason property owners make St George title transfers is to decrease personal liability in the event of a claim that is property-related. Remember that if you make a St George title transfer, you also need to get liability insurance through a licensed insurance agent so that other claims are also covered. And remember that Eagle Gate Title can help you accomplish every one of these St George title transfer steps, if you wish. We can help navigate any possible hiccups during the process, answer any questions that come up, and provide advice whenever and wherever needed. 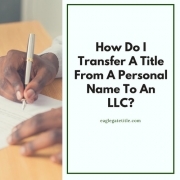 Transferring a title from a personal name to an LLC shouldn’t be a too much of a headache at all. http://eaglegatetitle.com/wp-content/uploads/2019/02/st-george-title-company-social.jpg 500 500 aloha http://eaglegatetitle.com/wp-content/uploads/2019/02/logo-300x212.png aloha2019-02-26 16:56:492019-02-27 19:33:23How Do I Transfer Title From A Personal Name To An LLC?